Going Nutty with Multiple Nutcracker Gigs? ‘Tis the season…for some dancers to perform Nutcracker after Nutcracker, week after week, company to company. As most dance companies or schools put on a production of The Nutcracker, opportunities abound for professional dancers to pick up multiple guesting gigs. Dancers in professional companies will perform in other productions as their own company’s schedule allows, and freelance artists bounce from city to city for their own personal Nutcracker tour. The benefit: these guestings tend to be a one-stop-shop and allow for multiple gigs to pile on. The disadvantage: each production is slightly different, so there are sometimes quick adjustments to be made. But most Nutcracker guest artists will agree that the season is a reliable one for making decent money and getting much performance experience. Here, Dance Informa speaks with three professional dancers who are quite seasoned in the Nutcracker guesting world to get the full scoop on how they juggle it all. 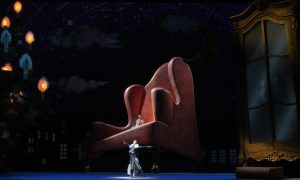 While a dancer in a big ballet company, such as New York City Ballet or the Joffrey Ballet, may do close to 40 performances of The Nutcracker in a given season, he/she is usually in one place, one city. A freelance guest artist, however, may do dozens of shows over the course of a season, but across multiple cities or even countries. Principal Guest Artist Abigail Simon, for instance, has an average of 14 shows with three or four different companies, and the most she’s ever performed is 30 shows in one season. Likewise, Barry Kerollis, interim artistic director of Alaska Dance Theatre and a freelance dancer, averages 12-20 shows per season, with performances every weekend from Black Friday to Christmas Eve. And Carlos Lopez, international guest artist and ballet master for the American Ballet Theatre Studio Company, has done 15 shows in three different countries with three different companies! What this boils down to is that guest artists must organize their rehearsals, schedules, travel plans and accommodations, sometimes with the help of the companies with which they’re guesting, and sometimes on their own. Abigail Simon. Photo by Gina Uhlmann Perno. While the sacrifice of being a Nutcracker guest artist may be a busy, travel-filled holiday season, with more gigs come more paychecks. Kerollis says that his Nutcracker guestings allot for anywhere between one-third to half of his yearly income as a freelancer. “I survive for a few months afterward, buy holiday gifts, pay off debts and pay my self-employment taxes with this income,” he adds. Simon notes that guest performances tend to pay much better than dancing in one company’s production. “Nutcracker guestings are the highest paying jobs of the year, are reliable and allow for multiple guestings in one season,” she says. Most dancers who do Nutcracker guestings perform the role of Sugar Plum Fairy or Cavalier, especially when the gigs are in a ballet school setting. Some dancers bring their own choreography from gig to gig, while others use each director’s set choreography. Regardless, guest artists will have to learn the movement for each production’s Act II Opening and Finale scenes. 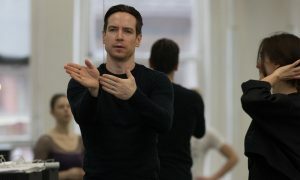 Kerollis, on the other hand, generally performs the choreography that is asked of him. “This means that I am learning the next show’s choreography while on the plane, bus or train to the next gig,” he says. Sometimes, guest artists may bring their own partner to a gig, while other guestings may require the guest artist to partner with someone from the school or company, chosen by the director. Lopez, who usually brings his own partner but has also done guestings with a dancer from the school, says he prefers the former. In previous seasons, for instance, Lopez partnered with American Ballet Theatre Soloist Misty Copeland in regional gigs. This year, he will dance with Boston Ballet Principal Ashley Ellis at one of his guestings at Central Wisconsin School of Ballet. 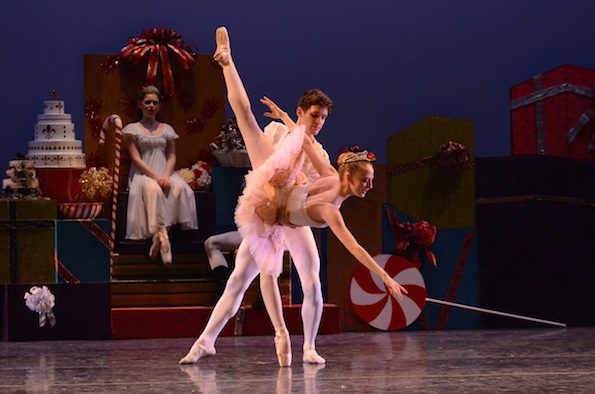 Carlos Lopez partners Ashley Tuttle in Evansville Ballet’s “The Nutcracker.” Photo by Bravo Photo Art. Guest artists often have other commitments aside from the dancing aspect of their gigs. They are often responsible for their own costume and music (if there isn’t live music, guest artists will want to perform to music of the same tempo to which they’ve been rehearsing), and they sometimes arrange transportation plans to and from each gig. They also usually arrange their own rehearsal time, especially in preparation for out-of-town guestings. While Lopez says that the advantage of rehearsing on his own is that he can stop when he is tired, he adds that it can be difficult to find studio rentals and coordinate a schedule with his ballerina. In addition, Simon says that the cost of a studio rental falls on the guest artist. 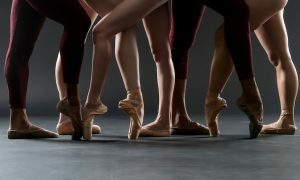 Traveling to different towns also entails dancing in different studios and theaters than one is used to. But it’s up to these guest artists to take care of their bodies and to make sure they find adequate time and space to warm up before performing, especially if a class is not offered. 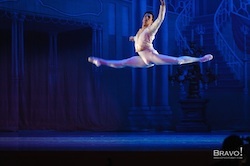 Carlos Lopez in one of his many “Nutcracker” guestings with Evansville Ballet. Photo by Bravo Photo Art. When doing several back-to-back gigs of the same type of show with the same music, it may take some extra effort to keep each production’s choreography straight. Whether they take their own choreography with them or perform what is asked of them, guest artists will face some differences show to show. Being a Nutcracker guest artist and finding and performing multiple gigs is a bit like being one’s own boss. Lopez says he has found his guestings through fellow dancers, directors and even through social media. Likewise, Kerollis says that as his reputation as a freelance dancer grew, people and organizations generally reached out to him. “Often, I get so many requests to dance that I can start passing out work to my friends,” he adds. Simon, too, says that networking has proven to be a wonderful asset to her freelancing career. She adds that, as a freelance guest artist, she also has more artistic opportunities than she did as a company dancer. To keep track of these busy guest artists, follow them on their websites: www.abigailsimononline.com, www.barrykerollis.com and www.carloslopez.org. Photo (top): Barry Kerollis juggles multiple Nutcracker gigs each season. Photo by Ruth Judson.